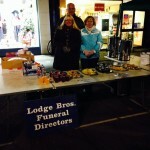 Shepperton’s annual ‘Big Tree Night’ street fayre, held in the High Street, took place on 10th December, and once again mulled wine served by Lodge Brothers’ staff proved very popular! This year, Company Director, Mr Andrew Lodge, joined District Manager Richard Leachman, arrangers Lindsay Tuckfield and Kate Thulborn and Lindsay’s husband, Barry in providing warming refreshment for the crowds who attended. Mince pies, biscuits, crisps and other drinks were also handed out in return for a donation to charity. The stall raised over £180 in two hours! Richard commented, “Despite the cold, it was good to raise such a princely sum in little over two hours! The money will be given to ‘The Greeno Centre’, a day centre in Shepperton which serves Christmas lunches throughout the festive period to the lonely and elderly. Lodge Brothers always try to help our local community through supporting worthy causes”.